St. Xenia of St. Petersburg, commemorated on January 24The first day of the civil new year begins with the celebration of an important act of our Lord, God and Savior Jesus Christ, which leads to another celebration of one of His great feasts. The liturgical texts for the month of January, blessed by His Eminence Metropolitan Joseph, are now ready for clergy and laity to download from the Online Liturgical Guide. On January 1, eight days after His nativity, our Lord consented to be circumcised in the flesh in order to become the only human to fulfill the Law of Moses. This act of humility and servitude shows that our Lord identifies with the low estate of His people to deliver them from sin and death by introducing God's grace that supersedes the ancient Law. On this same day, we commemorate St. Basil the Great, archbishop of Caesarea in Cappadocia, who reposed peacefully on January 1, 379. Numerous works of this Father of the Church are preserved, including theological, ascetical and canonical writings as well as the Holy and Divine Liturgy composed by him, which we will celebrate on New Year's Day. From there, the Orthodox Church moves to our Lord's Epiphany, or Theophany – His baptism by St. John the Baptist in the River Jordan. In this great feast, we celebrate the revelation of our Lord as God. Theophany is also known as the "Feast of Lights" in that Jesus, by His baptism in the River Jordan, enlightened the world. Christ's baptism also marks the renewal of humanity: our Lord is cleansed and He shows us how we must be cleansed of sin by drowning it in the waters which He blessed by entering them. Many Orthodox Churches offer two services of the Great Sanctification of Water on Theophany: indoors, where the faithful can drink the water and take it home; and outdoors at a stream, river, lake or ocean. On January 17, the Orthodox Church commemorates St. Anthony the Great, the legendary desert father who established monasticism. His life of humility and asceticism filled the desert with disciples who sought full communion with God as he had achieved. 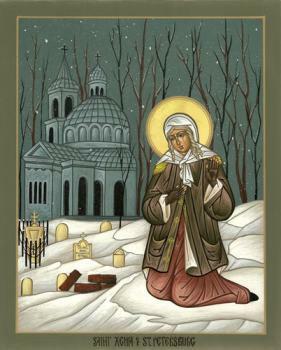 On January 24, we commemorate another humble ascetic: St. Xenia of St. Petersburg, "the fool for Christ's sake" who lived poorly in the big city to commune with God who gave her great gifts of prayer, prophecy and miracle-working. The Online Liturgical Guide, produced by the Department of Liturgics, provides the official, uniform word-for-word texts to be used for the divine services in all parishes across the Archdiocese. Should you have any questions, please contact Subdeacon Peter Samore at service_texts@antiochianladiocese.org.